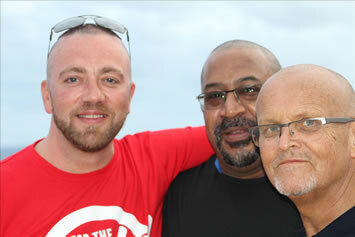 Join like minded bears, cubs, chubs, chasers, their friends and families on Arno's Bears Cuba & Key West gay group cruise. Cruise into Havana Harbor on board Royal Caribbean's Majesty of the Seas and discover largen-than-life culture, sultry rhythms and weathered beauty during your overnight stay. Stroll the Malecon and get lost among Baroque facades and colonial cobblestone streets of Old Havana. Or enjoy a friendly game of dominoes with the locals and live jazz music. Take the unique opportunity to get to know fascinating local culture while discovering the timeless sights and sounds of nostalgic Havana. Take a ride in a classic car through the historic Malecon. Explore the classic architecture of Old Havana, mingle with locals and partake of the cafecito ritual at Cafe Marina. Dance to live salsa. Come Seek a place untouched by time. Enjoy traditional Cuban fare such as moros y cristianos (black beans and rice) and ropa vieja (shredded beef).Visit the grandiose Capitolio Nacional and explore the world-class art collection at Museo Nacional de Bellas Artes, which showcases everything from colonial-era paintings to countless masterpieces from Cuba's famed Vanguard period. Enjoy a friendly game of dominoes with the locals. Sip a daiquiri at Hemingway's favourite haunt, El Floridita, happen upon a live jazz group and simply savour the eclectic moment in this unique corner of the Americas. 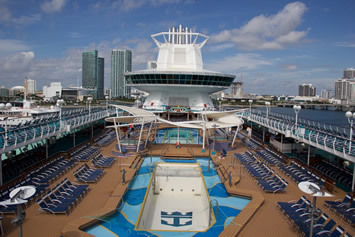 The Majesty of the Seas has had a complete makeover - newly renovated, it boasts a new pool deck, the spa is bigger, and the rooms are even more comfortable and amazing than before! 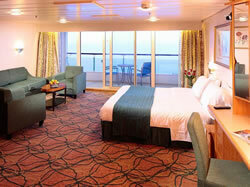 Each room on this ship now has its own flat-screen TV! Add to the list new restaurants and the entertainment and service that you have come to expect from Royal Caribbean, and you've got yourself the cruise of a lifetime! So book a cruise today! 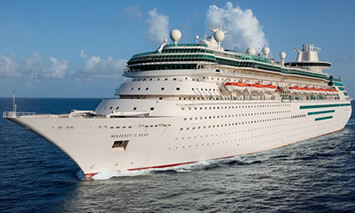 The Majesty of the Seas is chock full of things to do! Check out the rock-climbing wall, or relax by one of the two outdoor pools! There are also two whirlpools on deck. Pamper yourself at the day spa, or work up a sweat in the fitness center, which also features an outdoor, open-air basketball court! There are even areas that are only for teens! 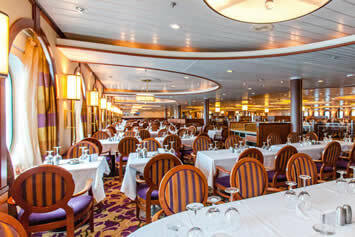 The Majesty of the Seas offers delicious cuisine for you to enjoy! Choose from the regular dining options, which are served in a spacious dining room and offer a full menu of your favorite foods - or go for something a little different! 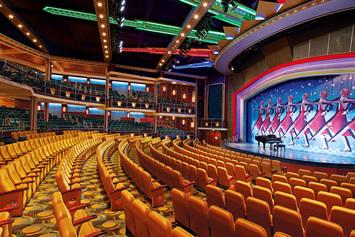 The ship has a Johnny Rockets, a '50's-style restaurant that has diner food, as well as a Sorrento's Pizza! If you like coffee, there's Latté-tudes, a coffee house that serves Seattle's Best Coffee®! There's something for everyone - and don't forget, Royal Caribbean has 24-hour room service with the full breakfast, lunch and dinner menus! 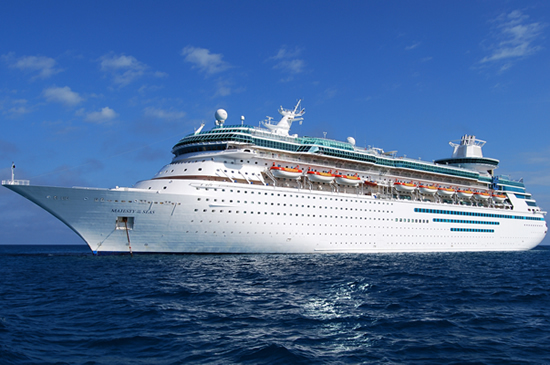 The Majesty of the Seas will entertain you for the entire day and night! Featuring great live performances of Broadway-style musicals, as well as live jazz and big band and much more, your night will start off right! The ship has themed bars and lounges, great cocktails, and great places for you to relax with a drink and good company! If you like to dance, head over to the ship's nightclub and groove to the beat - the DJ plays your favorite songs all night! If you're feeling lucky, head to the Casino Royale, an onboard Vegas-style casino with your favorite games and slots! 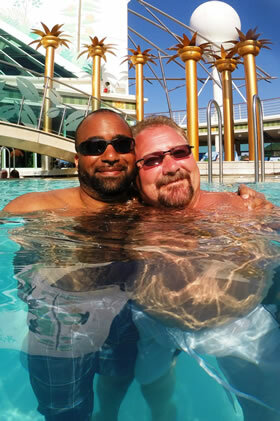 So don't wait a minute - book a cruise on the Majesty of the Seas and let the party begin! 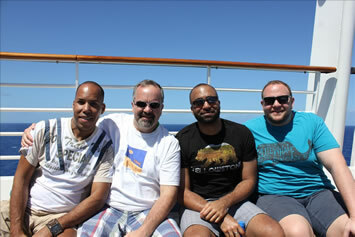 12 Nov A Day at Sea! 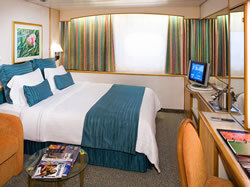 Junior Suite A stay in a Suite onboard Majesty of the Seas® offers a cruising experience unlike any other. With luxury amenities, sweeping views and a spacious private balcony, this is a home away from home that you’ve never experienced before. 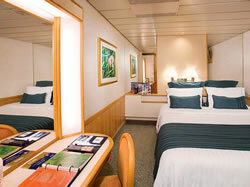 Taxes of $174.47pp, gratuities ($72.50 pp) and optional insurance are additional. 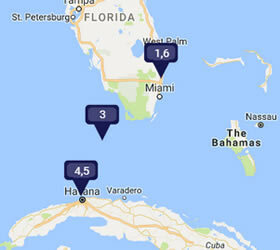 A Cuba visa and health insurance will be arranged by the cruise line for approximately $75 per person. If you cancel 90 days before departure: $250; 89-57 days: 50% of total price; 56-29 days: 60% of total price; 28-15 days: 85% of total. Less than 14 days: 100% of total. Costs are applied to total (incl. Taxes).